Otherwise known as Constitution Square, Syntagma Square is a very significant area that you will probably encounter several times during your stay in Athens. The square has a long lasting history and even today you have a good chance of finding a demonstration of some sort in or near the square. In the square's center there are copies presented by Lord Bute, a court retainer of King Otto, of statues from a Naples museum. The 100 or so trees within the square include oleanders, orange trees and cypresses. The square is a conflicting mixture of bumper to bumper cars and shoulder to shoulder people on its lower perimeter and a more serene, wider, tree shaded, central expanse; the focus of which is a brown marble fountain in the middle of the square. Its turned on most of the time. The many benches provide room to take a break in the shade. There are three metro entrances in the square. The whole of today's Syntagma Square was the front lawn of the palace with which Otto's bride, Queen Amalia concerned herself with. Initially the Greek public was admitted into the gardens but the Queen felt this privilege was being abused and banned their entry. The ostentatious palace and luxuriant gardens stirred up resentment with the Greek populace. Further the Queen, in order to water the plants, diverted several reservoirs which supplied residents with drinking water. Otto was deposed in 1862 and King George I of Denmark replaced him. After ten months or restoring, Syntagma Square is open to the public again, more beautiful than ever. The design of the square was kept unchanged. All white marble has been renewed as well as the many benches. The old lampposts have been replaced by beautiful new ones. The fountain has been renewed and water ponds have been put in on the long sides of the square. Most of the big stairs leading up to Amalias Avenue is new too. One can’t help but admire the efforts the City of Athens has put in restoring the square. With all the new white marble and the Athens sun lighting it up, one does need sunglasses on the square though. Plateia Syntagmatos (Constitution Square) is the heart of modern Athens, where you'll find hotels, offices, banks, restaurants and cafes. 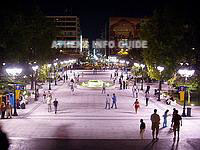 What is most interesting in the square though are the Athenians themselves and it is very much used as a meeting point. When first built in 1843, today’s Parliament building (the Vouli) was designed as an imposing palace for imported and unwanted King Otto Wittlesbach, a 17 year old Bavarian prince and son of King Ludwig of Bavaria. King Ludwig ran out of money and the Bavarian state architect, Friedrich von Gartner, complained that the resulting structure, without his proposed but unaffordable decorative embellishment, looked like an army barracks. The building is a representative sample of the early period of Neoclassicism in Greece, and it is a work of strict geometry in its mass. The Palace had 365 rooms and 1 bathroom whose water faucets produced a trickle of water, dead cockroaches and fauna. The building was remodeled in 1910 to house the Hellenic parliament. Today, it still serves as the seat of the Hellenic parliament and houses offices, the national assembly room, the office of the president of the assembly, the archives and other services. In front of the parliament building is the Tomb of the Unknown soldier. It is guarded around the clock by the Evzone's. Read more about them and the changing of the guard on the Evzones page. You will find the Monument of the Unknown Soldier in front of the Parliament on Amalias Avenue and Syntagma Square. Its central part, created by the sculptor Fokion Rok, depicts a naked dead soldier only carrying his armor. This image was inspired by a sculpture on the pediment of the ancient Temple of Aphaia on Aegina Island. Writings from Pericles' funeral oration, as it was passed on by Thucydides, are engraved on the wall around the soldier. On the two sides of the moment there are copper plates listing all the military events in which Greece has taken part from the Greek War of Independence (1821) till today. The monument was made in 1929-30 and designed by the architect Emmanouil Lazaridis. It actually is a cenotaph (a tomb or a monument erected in honor of a person or group of persons whose remains are elsewhere) which, in the tradition adopted by numerous countries, commemorates all the fallen soldiers of a war. The monument’s style is intended to unify it with the neoclassical style and the significance of the Parliament. It gives the impression of a “timeless” monument, as if it were always there to remind the visitors of Greece’s glory. The monument is guarded 24 hours a day by the Presidential Guard, also known as Evzones (Evzoni), who are wearing the traditional 19th century costume from southern Greece. The most characteristic part of this uniform is the skirt called foustanela. There is an hourly change of the guard. On Sundays at 11:00, there is an official change accompanied by military music. On Greece’s national holidays of 28 October and 25 March, a grandstand is placed in front of the monument for statesmen and officials attending the parade. Read more about them and the changing of the guard on the Evzones page. The space between the Monument of the Unknown Soldier and Amalias Avenue is officially called Parliament Square although people refer to it as the “Unknown Soldier” or “O agnostos” (the Unknown). Excavations for the metro station (Syntagma) uncovered the bed of the river Eridanos which used to flow down from Lycavittos Hill as well as a complex of Roman baths, a bronze sculpture workshop and numerous tombs. The pigeons of Syntagma have been around as long as the square has been there. Even in the old days when the square was the front lawn of the palace of Otto, there were pigeons. Most of the other birds are in the National Gardens and leave the square to be pigeon territory. You will find the majority of the pigeons in the open space in front of the Tomb of the Unknown Solders where you can buy seeds at a little stand to feed them. When you do, you will be in the center of their attention. They will sit on your hand, arm, shoulder, yes, even on your head. They used to having adults and children around. The pigeons will stay close to you when having a snack on the street terraces of one of the fast food restaurants at the opposite side of the square. They clean the street of anything eatable dropped and they will inspect your table after you have gone, looking for leftovers. Some kiosk owners put little containers with fresh water at the foot of trees for the pigeons to drink from. 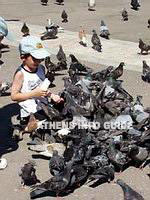 The pigeons are as much of a historical part of Syntagma square as is the fountain, the statues, the benches and the trees.